The representatives from Bilim Pharmaceuticals struggled to answer all the questions they received in their short encounters with doctors, and could not accurately capture information ...from them either. By tossing out the brochures and using 2 in 1 convertible devices, they have been able to improve their presentations of the latest medications and feed more data into the customer relationship management (CRM) system in real time. • Improve data capture. Bilim Pharmaceuticals’ reps were updating the customer relationship management (CRM) system at home after brief meetings with doctors, sometimes days later, resulting in data loss. • Increase flexibility. Pharmaceutical reps reliant on brochures can only talk about the medications covered in those brochures when they meet with doctors. • 2 in 1 convertibles. Bilim Pharmaceuticals replaced its printed brochures with Samsung ATIV* 2 in 1 convertibles, based on the Intel® Atom™ processor. • Cloud-based CRM. The new custom Mobilim* app by TCM enables reps to access data on doctors and sales presentations while gathering meeting data in real time. 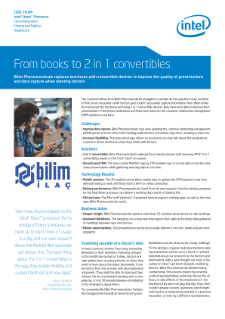 Read the full Bilim Pharmaceuticals: From Books to 2 in 1 Convertibles Case Study.